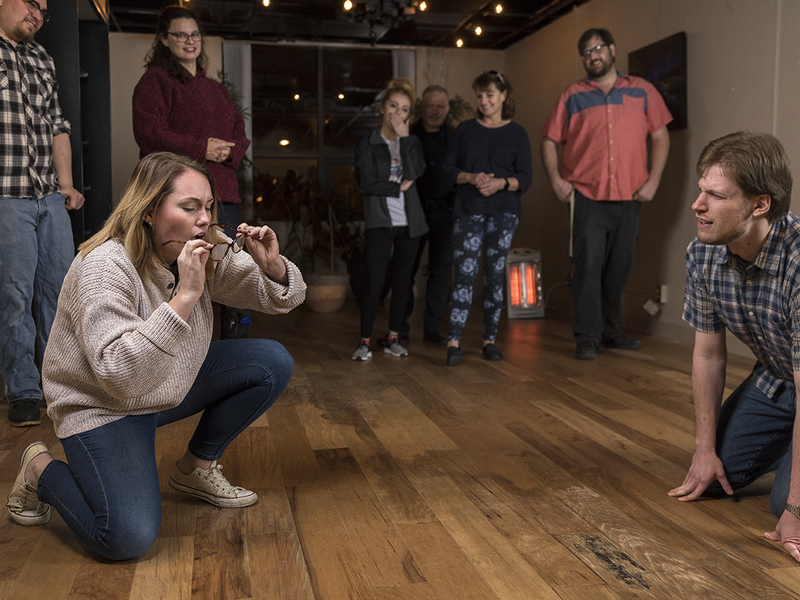 Writer Lillian Stone dived headfirst into an improv class with Jeff Jenkins, 417-land’s improv godfather, and discovered a few things about herself along the way. Photo by Chuck TraversWriter Lillian Stone pulls out all the imaginary stops while acting out an improvised scene with the Queen City Conservatory. It was a chilly Sunday afternoon, and I was standing in a circle with six other people throwing a finger snap around like a baseball. Across from me, a bespectacled man reared back to wind up his snap. He snapped his fingers proudly, tossing the snap to my neighbor, who caught it and casually snapped my way. I put my hands up and caught the snap. I grinned and pantomimed dribbling the snap like a basketball, considering where to send it next. 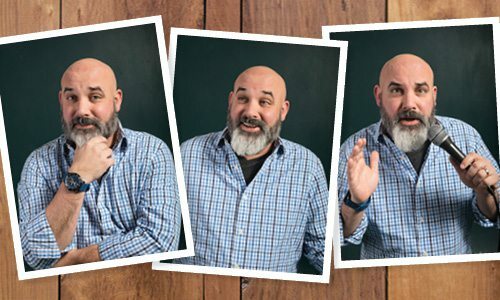 It was my first day of Queen City Conservatory’s Improv 101 class, and I would spend the next six weeks turning those snaps into scenes, learning the basics of improv—including the iconic “yes, and” rule, which I’ll get to later—and building up my own confidence in completely unexpected ways. Queen City Conservatory, 417-land’s newest performing arts training center, began in mid-2017. However, conservatory founder Jeff Jenkins has been in the performing game for decades. Longtime 417-landers likely remember now-defunct improv troupe Skinny Improv, which Jenkins founded in 2002. Over the course of a decade, Jenkins took Skinny Improv from a fledgling ensemble to a professional-quality group performing more than 500 shows a year. Eventually, though, the frenzy took its toll on Jenkins. He stepped away from Skinny Improv in 2014, taking several years to explore other opportunities including a stint at Chicago comedy landmark The Second City. Now, Jenkins is back. He’s rested, and he’s hungry—you can see it in the mischievous glint in his eye when he tells his story. 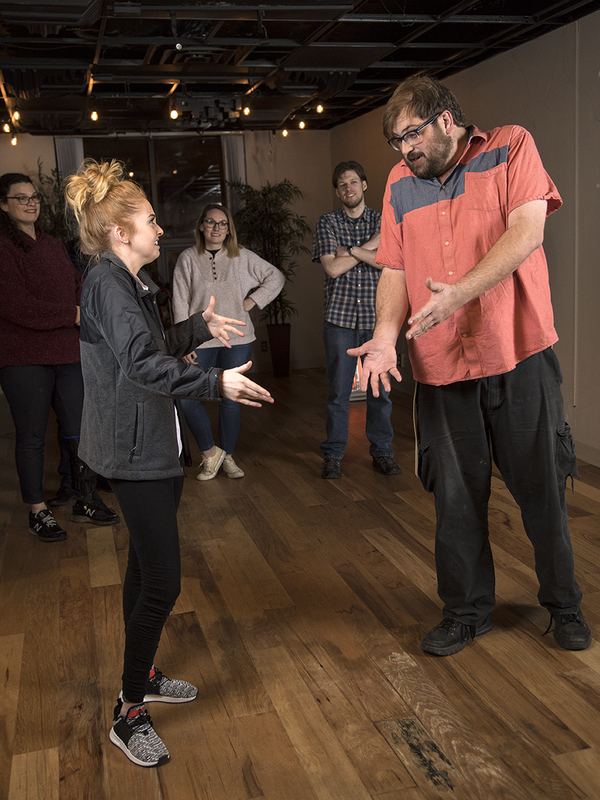 The newly formed conservatory offers courses in improv comedy, sketch comedy, acting, public speaking and more, but goals of the conservatory extend far beyond performing. According to the conservatory’s mission statement, it’s about “helping [students] unlock the potential for greatness that they may not see yet, so they can turn a hobby into a career.” Queen City Conservatory’s website mentions turning “fear into focus” and “instinct into ideas.” That focus is exactly what I found when my editor sent me to take the conservatory’s introductory improv class. Ultimately, a conversation with a classmate really helped me wrap my head around “yes, and.” A few weeks into the session, I looked down at my classmate’s wrist to find the words “YES, AND” tattooed in a typewriter font. He was a more seasoned improv maven, having trained in the early days of Skinny Improv. “For me, ‘yes, and’ is a lifestyle,” he explained. “You can’t always change the things that are going on around you, but the ‘and’ is your chance to tell your part of the story.” That’s the crux of good improv: taking the reality created by your partner and building upon it until, together, you make something great. Photo by Chuck TraversThe conservatory offers classes in improv comedy, sketch comedy, acting, public speaking and more. After learning the basics in our first few classes, we moved on to full-blown scene work. We stood up in front of the class two or three at a time to create a scene from scratch. Throughout the class, Jenkins emphasized the importance of recognizing your partner’s reality. If your partner’s actions in the scene placed you somewhere completely implausible—say, outer space—it was your job to accept that reality and “yes, and” it. Along those lines, Jenkins encouraged us to “bring a brick, not a cathedral.” Basically, a successful improviser should come into a scene with an open mind instead of demanding that their scene partner follow their lead. Like many of improv’s golden rules, it’s something that can be applied offstage in pursuit of becoming a better friend, partner or co-worker. For me, what started as snapping in a circle turned into a seriously empowering experience. Simply put, improv taught me how to play again. Improv enthusiasts often say that humor is a muscle that must be exercised regularly lest it lose its edge. Now that my humor muscle is thoroughly warmed up, I’m able to apply the lessons I learned in Improv 101 to every aspect of my life. My writer’s block has all but disappeared. I’m more confident at work and in relationships, and I’m convinced that it’s due to the boldness I cultivated during the class. Good improvisers don’t shrink themselves; they grow alongside their partners, learning more about themselves along the way. The hardest part of the class was giving myself permission to fail. As Jenkins repeated almost every week, improv isn’t about perfection; it’s about being okay with failure. For a neurotic people-pleaser like myself, that’s a scary thing. Lucky for me, it turns out that fear is normal, healthy and encouraged in improv. “Do what scares you,” Jeff said throughout the class. Now, I’m trying to do more things that scare me—including signing up for Improv 202. Want to see what improv can do for you? Information on upcoming Queen City Conservatory sessions can be found at eljenkocomedy.com/queencityconservatory or on Facebook at facebook.com/queencityconservatory. The next session is already in full swing.